The Hadzabe welcome visitors and may also be invited to join in on a hunt. The Hadzabe is another very unique tribe to visit. While the women forage for edible vegitation, the males hunt by poison arrows any game ranging from mice to giraffe. The favored meat is babboon. Their shelters are so temporary that often when a large game is killed such as a giraffe, the tribe will relocate to the kill site rather than attempt to transport the game. The clothing of the Hadzabe is also opportunistic, wearing anything from donated western style clothing to animal skins. Attempts by the government to educate and modernize the lifestyle of the Hadzabe have to present failed but their available hunting grounds are diminishing and their lifestyle is in danger. 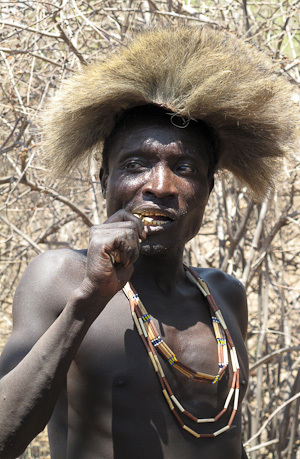 The Hadzabe welcome visitors and may also be invited to join in on a hunt. While hunting is a daily event, the majority of their diet is foraged roots and berries. They are expert honey gatherers, and have an excellent knowledge of natural medicines. With cililization encroaching ever closer, it is driving away much of the larger game that was once hunted, making this lifestyle ever more difficult.